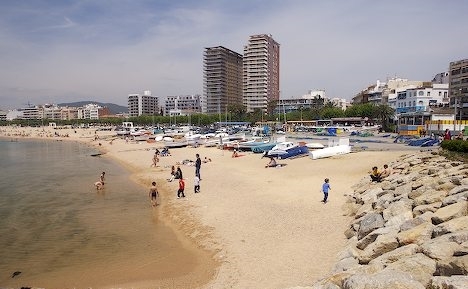 Palamos is the name of the village, of Roman or Iberian origin and an important fishing and commercial port, situated in the beautiful bay of the same name, Palamos. With a population of almost 15000, the town has about a dozen excellent hotels and is a first class tourist centre. To the west, El Collet de Santa Margarita or de Vilarorno (an old Roman settlement) and the Aubi stream separate Palamos from Sant Antoni Calonge. To the east, the Palamos bay is cut off by the Punta de Moli and Cap Gros, between which there is a small and beautiful cove, Santa Margarita. Palamos can be divided into three parts: the new, developing sector, stretching out along the water; the fishing port and industrial zone, the latter with its famous cork factories; and the old town, situated on top of the "El Pedro" promontory, capped by the principal church. The lighthouse on top of the nearby cliff at the Punta de Moli finishes off the silhouette of the village where it reaches the sea. 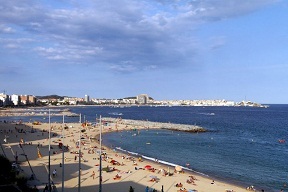 Radio Costa Brava's transmitting station is located at Palamos. There is also a museum with a generous collection - archaeological, maritime and cork products - with some very interesting exhibits. A promenade and esplanade alongside the sea provide easy access to the city for many vehicles which come to visit it. North of Palamos, between the enormous hump of "Cap Gros" and the mound of Sant Esteve -with the remains of the defense system of the medieval town- lies La Fosca beach. It has been named after the rock "Roca Fosca" which divided the beach in two, and it remains a peaceful and relatively not too crowded location. Apart from an original Roman or Iberian settlement which has not left any notable traces, the renaissance of Palamos dates from the beginning of the Middle Ages. A letter dated 1279 sent by king Pedro el Grande, reveals the importance of the port of Palamos, which permitted him to introduce a wedge of power into the mosaic of the feudal nobles of the l'Emporda. During the sixteenth and seventeenth centuries Palamos used to be the port of departure for the campaigns in Italy.